Do You Have Pet Urine Damage? The following is a how-to for managing urine stains and odors. Keep in mind that you can always give us a call to schedule a cleaning of these types of stains. 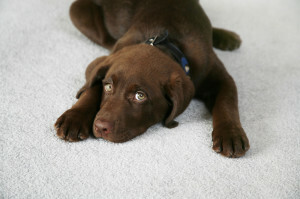 Pet urine can cause permanent damage to your floors and fabrics. Pet odor can also create an unhealthy indoor environment. When urine is first deposited onto a carpet or fabric, it has a pH of 5 or 6, which is on the acid side of the pH scale. It is easier to remove at this point, when it is fresh. Once it dries it becomes alkaline, reaching a pH of 10 to 12. At this point it is more difficult to remove. The warm acid state of the urine offers a perfect breeding ground for bacteria, which begin to grow immediately. In the original acid state, the urine begins to oxidize and react with the carpet to create a color change, also known as urine stain. As time passes, the pet stain will become increasingly more difficult to remove, depending upon the carpet. The dye structure of the carpet may sustain permanent damage. Bear in mind that over-the-counter products (i.e. Resolve, Oxyclean, etc.) may set the stain.We recommend none of these. The primary source of odor associated with urine comes from bacteria that grow abundantly in dark and warm places with a never ending food source. This bacteria growth and breakdown of the urine creates amino acids. These complex organic compounds will often work deep into the fibers until they actually become part of the fibers. At this point the odors are very difficult to remove. The waste materials and gases from the decomposing urine create an unpleasant odor. When dried urine is re-moistened it gives off an ammonia gas which is extremely unpleasant. Urine odor, if it has become dormant, will sometimes “come alive” on days of high humidity. The salts and crystals that are left behind as the urine dries are hydrophilic and thus draw water to them. Dried urine “comes alive” during humid months because the salts are attracting moisture, and when the moisture evaporates the ammonia gas is released to the air. This is why cleaning existing urine stains may not completely remove any associated odor. In fact, it could increase the odor in the environment temporarily. The best household tool that we have found for removing pet urine from carpets is Bissell’s SpotBot. Getting pet urine out of the carpet while it is still fresh will raise the possibility of 100% removal. Vacuum (extract) as much urine as possible from the carpet with the SpotBot. Then apply Santa Fe Floor Care’s Avenge and allow it to dwell a few minutes. Then spray some water over the area with the SpotBot and do a final extraction. Try not to rub or scrub the carpet as this may distort the face fibers. Removing an old urine deposit is a bit more difficult. Apply Santa Fe Floor Care’s Avenge. Rinse the carpet with warm water from the SpotBot and then extract. At this point you can mix 1 part white distilled vinegar with two parts water and apply it to the affected area. Allow the mixture to dwell a few minutes. Rinse the spot with warm water and then extract. Bear in mind that the vinegar mixture will only work on old urine deposits. The vinegar works best on deposits which are more than 24 hours old. Which Cleaners Work Best for Urine? Enzymes are the best cleaning agent for urine, vomit or feces. An enzyme is the only cleaning agent that actually eats up bad bacteria. For the best results use an enzyme spotter after you have rinsed the carpet, especially if the spot is not a fresh one. Do not use any over the counter products with high pH such as ammonia, Resolve or Oxyclean. Our experience is that these products may set the stain. These products will also leave the carpet with a residue in a high pH state. The carpet will then attract dirt like a magnet. Call Santa Fe Floor Care if you do not know what to use. These are the steps that we take for 100% removal of urine odor. In taking these steps we remove all the alkaline salt deposits left in the carpet. Disclaimer: Use these techniques at your own risk. Always read the directions on any spotter before using. PRE-TEST EACH SPOTTER IN AN INCONSPICUOUS AREA BEFORE USING. If urine stains or odor persists, call Santa Fe Floor Care (512) 632 1621.